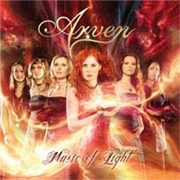 ARVEN are a five-piece predominantly female band from Germany. They play epic melodic folky something. Not sure if metal is the right denotation here, since their drummer and some occasional guitar riffs are the main harder ingredients. They want to be compared to BLIND GUARDIAN, SONATA ARCTICA or EPICA, or even LEAVES EYES. The latter with less metal is probably the best comparison since Carina Hanselmann possesses a fine voice. They open with the title track, which is a fine effort with a violin riff and a compelling opening. The refrain works but the metal is not a 100%. “On Flaming Wings” sports a fine metal riff but also reveals the automatic limitations of an operatic voice, the ability to sound heavy is somewhat limited. They often go for a folky speedy approach which I lack in the info sheet. Their finest moment, according to me, is one of those. “Ruined Castle” sports more metal, or metal, with more than a slight touch of folk. When they come across as the female bastards of BLACKMORE`S NIGHT I enjoy them very much. But all the female emphasis, flute and violin riffs, seemingly separate bands playing the same song in two versions at the same time, well… Maybe they are ahead of their times, but this is a mixed bag that is too much at the moment. But the ability, the melodies (mostly) and the trendy touches of Ritchie and EPICA are there. I may shake my head at the over-sweet “My Dear Friend”, but I may smile at the almost ALESTORM-ish ending of “A Stranger´s Story”. But the real grip of my interest they don´t attract. Not this time. At best they will become Swedish ESC contributor and mezzo-soprano Malena Ernman´s wet metal dream. For now. But with a re-think…who knows.